Wow, that's incredible bepnewt! I wouldn't have even thought it possible to win on your third attempt. 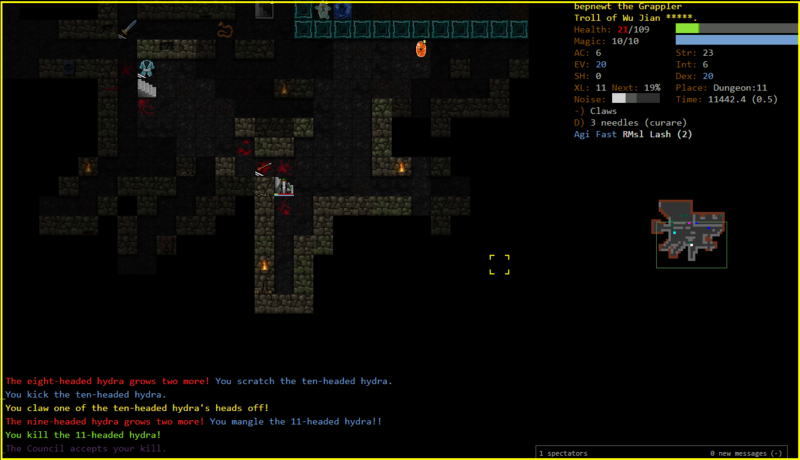 Zot:5 is horrible now, with the Sentinel's Mark traps. 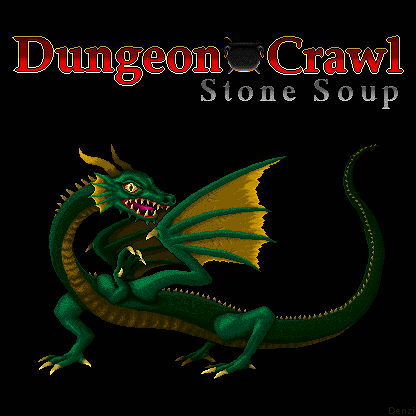 At one point I had six orbs of fire on me as I downed ten heal wounds potions in a row waiting for a teleport to kick in. It almost felt a little unfair? It's disastrous to get Marked and there's so little you can do to avoid it. Maybe if it took Magic Resistance into account it would feel like something you could plan around? Began as a Centaur Hunter on Feb 11, 2019. ... and 3 runes on Feb 13, 2019! The game lasted 03:42:33 (97026 turns). MVP was a vorpal longbow. Kept it pretty much the entire game. Abyssal Rune was torture as usual. I'm going back in and will be a leeeetle more careful this time. Awesome work, Math! I saw both of you in the same place (Zot) with the same builds and was wondering how that was going to turn out. Potions of cancellation remove the mark and are super helpful for those situations. I'm pretty sure I would have died if I hadn't used them in my recent game. I got marked right as I teleported in Vaults 5 at about half health. Without the potion of cancellation I think I would have lost right there. I think I used one on Zot 5 too. Speaking of Zot 5, I confess I'm not a big fan of the mutation mechanic in its current form. I miss the rMut items, and the remove mutation potions. I get that potions of mutation are generally positive now and do much of the work of remove mutation, but in a game that has so many fun parts, it stands out as unfun. Another Ogre smooshed me. I need to start a Ranger and make them my favored enemy. I tried to hit him from range, but had just turned on Bow skill training about a minute before so it didn't do much to him before smoosh-time. Yep, had that happen on my CeHu game, except one of them was a Zot trap. Good times. Also, those dispersal traps are ultra deadly in Zot. So, I did something crazy with this situation: I went to the left hallway and shouted a lot. Nothing came. I went to the right hallway and shouted a lot. Nothing came. So, I jumped onto that alarm trap in the left hallway, and started running for the stairs. Everything came. At one point I was fighting at least 8 orb guardians, which were being berserked by 3 moths of wrath, followed by an ancient lich and 5 orbs of fire in a row. Literally in a row. And only briefly, near the beginning, was I worried. Crazy strong character with tons of resists. I should've gone for extended, but I locked in a win as a Troll Monk of Wu. Don't let him fool you. The only reason he won is because I watched him kill the last 4 or so Orb Guardians. If I hadn't been there distracting him with questions, he would definitely have died. I think I'll try the Troll Monk thing. His life-goal will be to hunt down every Ogre to enact revenge for my previous attempts. 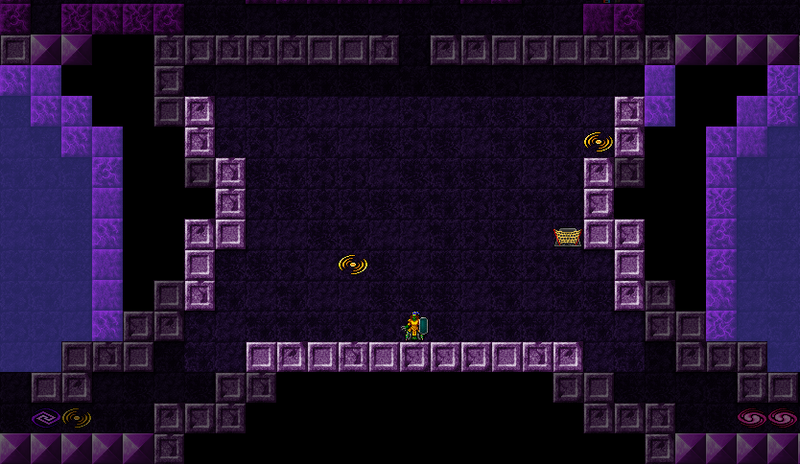 I feel obligated to mention that I DO NOT recommend voluntarily stepping on alarm traps in Zot:5. Just because it worked out well in my situation, doesn't mean it's the correct play, like ever. It was really funny finally stepping on the dispersal traps on the right, to get into the outer lungs, and then walking through all four lungs + the orb chamber, only to find a literal total of one orb guardian and an electric golem. So, 11 heads are better than 5, right? Apparently Claws = Slicing weapon. Barely got through this fight. I had decided I was dead so just kept attacking. I'm still not sure how I survived. ...and there was much rejoicing! Congratulations, MichaelH! Go Team Hubris Maximus! As well as congrats to math and merphle as well! Congrats to merphle and MichaelH on their recents wins! Three wins by players whose names start with M in a row! I'm playing what I think might be my first troll as well and just ran into a hydra in Lair. I wondered about the claws, and was reading this to figure out what to do. Why when I play casters do I get +Slay items, and never get them with melee characters? And it's not like I can even change the character to a melee as its a DE with a Str of 6 and max HP of 98 at XL 21. The new traps in Zot are a little much IMO, but it worked to my advantage. I was completely surrounded in the left lung, just getting thrown around and surrounded by every damn thing in the level. Then a lucky teleport landed me in the *right* lung. Everything was over on the other side, so I made a beeline for the orb and tele'd until I could gtfo. I am hopefully coming up on going for my third rune and was thinking of doing V5. I was thinking of going down hasted as casting ignition a few times. That should work right? Or do I need to immolate first? Immolate will cause flame clouds to persist after death, causing additional damage to enemies still alive — and you. Ignition gives you immunity to the fireballs that it creates, but not any immolation fire afterward. Congrats math, merphle, Michael and bepnewt. I was coming here feeling all high and mighty ready to brag about winning two in a row when I see that bepnewt won on his 3rd game ever. Who does that? Makes winning two in a row feel pretty bland, like about the same level of accomplishment as taking a dump and not missing the bowl. I probably went 100 games before I won my first. math, centaur hunter has always been a favorite of mine. Simple 1-trick pony (so to speak) gameplay. Get a good longbow and be a machine gun. Kite as needed. Now its on to octopode, my holy grail species. I may not win again but I'll have fun trying. Congrats on two in a row, Copingsaw! That is awesome! I got a troll of Yred to XL 13 or 14 last night, but I'm not all that confident in his long term survivability. I somehow manage to get all my followers killed pretty quickly. I watched some Let's Play where the guy ends up every level with a horde of undead buddies following him around, but for me it's just usually my troll and a half dead rat skeleton or something like that. Hydras in the lair are in particular efficient at just ripping apart my followers before I can do anything to help. At some point Yred starts to gift skeletal warriors and vampires among others and then profane servants and bone dragons. These are survivable and you will get a nice little army going until vaults, depths and zot where they can be whittled down to nothing. 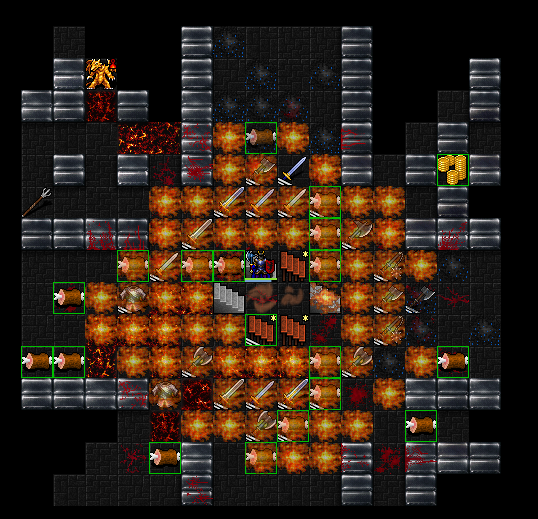 For my run I actually went back and did elf and crypts to build up my army again before finishing zot. They all died but it was enough to get me through zot 5. For undead you just need to raise everything you can and generally you can build up a nice little army by the end of each level. Finally, capturing the soul of a good unique like mennas or mara or a jugernaut or can really help. Seeing mara make copies of himself and others to fight for me was great. I'm watching Merphle on the other screen. He just dropped a Qazlal bomb on V:5. Fun to watch. Hey I remember that. That happened during my Hill Orc Fighter of QazLOL win just now, which coincidentally gives me a streak of two wins. And congrats on your streak, Copingsaw. Ed: BAH! I knew going in that I wasn't in the right frame of mind for playing, but I did it anyway. TL;DR: multiple black draconians doublezapping your rElec-less self hurts. A lot. RIP Math. No potions of Resist? Congrats on two in a row, merphle! Heck of a job! And thanks for the helpful Yred tips, Copingsaw! I keep forgetting about capturing a soul, too. I don't know if it's helpful to anyone at all, but I've gotten into the habit of doing a ctrl-f . before going down to a new floor to make sure I haven't missed anything. It's actually helped quite a bit. Yeah, I've been doing that for the first couple of D levels, when the game is the most variable. It definitely helps.